These small animals, weighing no more than a few pounds and stretching no longer than the common rat, are covered in a gray/brown fur (with lighter coloration on the underside, neck and face). Large tails complement their slender, almost serpentine builds. Their stubby legs are matched by their blunt faces. 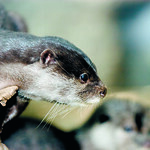 As their name implies, Asian small-clawed otters are native to Southeast Asia. 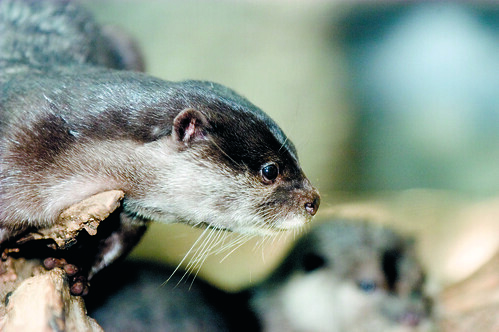 Asian small-clawed otters are endangered due to habitat loss. Lincoln Park Zoo participates in the Asian Small-Clawed Species Survival Plan®, a shared conservation effort by zoos throughout the Association of Zoos and Aquariums. Traditionally the Asian small-clawed otter occupied freshwater swamps, rivers, tidal pools and irrigated rice fields, where they dig burrows in muddy banks. As diurnal animals (active during the daytime), these otters hunt in the sunlight. Prey include shellfish and crabs. Asian small-clawed otters form monogamous pairs, producing two litters (of as many as six pups) each year. Males help build the nest and deliver food to females after birth. Newborns are helpless and spend weeks in the den. Offspring stay with their mother until the next brood comes along. These otters can remain underwater for as long as eight minutes. Asian small-clawed otters mark their territory with droppings that alert peers to their presence.